Built to stimulate the economy during the Depression, the Daytona Beach Bandshell opened on July 4, 1937. Tucked at the edge of the Atlantic Ocean in the middle of Ocean Walk Village, it is one of the area’s most recognizable landmarks. This historic coquina amphitheater hosts an impressive outdoor concert series featuring acts ranging from bluegrass and country to big bands, swing and dixieland – with everything in between. These free concerts are a hallmark of the Spring and Summer seasons at Ocean Walk Village. For the summer concert schedule and further information, please visit bandshell.org or daytonabandshell.com. 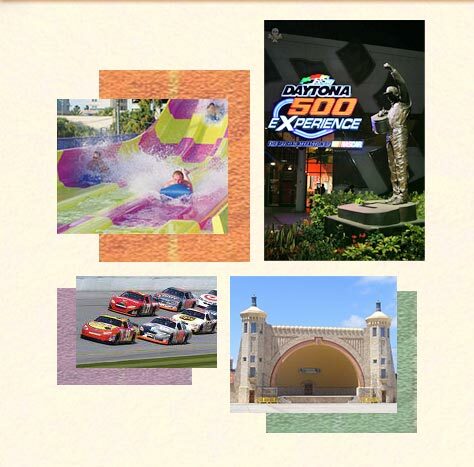 Daytona USA is a one-of-a-kind interactive motorsports attraction featuring hands-on activities designed to appeal to everyone. The high-energy motorsports shows and activities at the "Official Attraction of NASCAR" include the motion simulator rides "ACCELERATION ALLEY" and "DAYTONA DREAM LAPS," "The Daytona 500 Movie" and the “16-Second Pit Stop Challenge”. Also, don't forget to check out the winning Daytona 500 car in Gatorade Victory Lane or take a behind scenes 30 minute tour of Daytona International Speedway. With more than two dozen championship courses and moderate year-round weather, guests to the area can experience great golf. The Daytona Beach area offers courses designed by Rees Jones, Arthur Hills, Arnold Palmer, Gary Player, Lloyd Clifton and Bill Amick. Home to the headquarters of the Ladies Professional Golf Association, the area offers some of the country's most beautiful and challenging courses -- but without the hefty greens fees. Daytona Beach is also proud to be the headquarters of USA Tennis Florida. The center offers 24 clay hydro-courts, 12 lighted courts for night play, daily play, tournaments and much more.